Trying to tune into someone else’s idea of how exciting minimal techno could be before eight in the morning isn’t always a rewarding task. But by the time this was playing the autumn sunshine appeared – I didn’t really, it just felt like that. 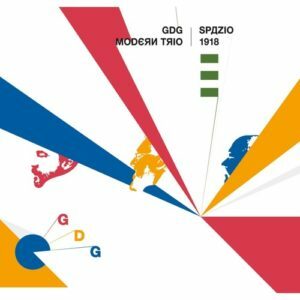 Ghittoni Dorella and Giampaoli’s collaborative project sees the music touch upon all sorts of wild styles and varied influences compounding them into the GDG MODERN TRIO. From the strolling basslines amid the strident rhythm guitar of Audrey’s Blues, through to the suggestive late nights captured via X-Rated, the album plays like a non-stop cabaret of earthly delights that never fails to excite, tease and suggest. Crisscrossed by a series ambient interludes as Interferenza the selection implies a retrospective vibe yet there is still something exciting and new about the playing of mostly traditional instruments by the pair, such as the glassy guitars of Spirit which suggest a sixties soundtrack. Spazio 1918 eventually leaves you with the Balearic reassurance of Micronesia complete with its rocky chords and pulsating drums. Music for cinema, tv, dangerous encounters, or simply a walk in the park.